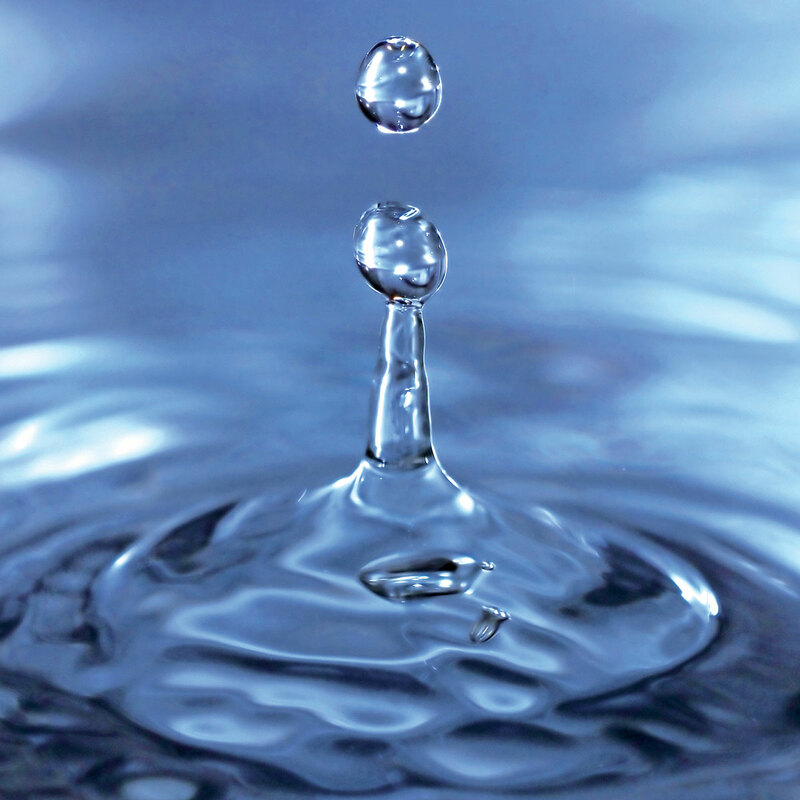 Biodiversity is a fundamental resource for human beings, such as energy and water resources. 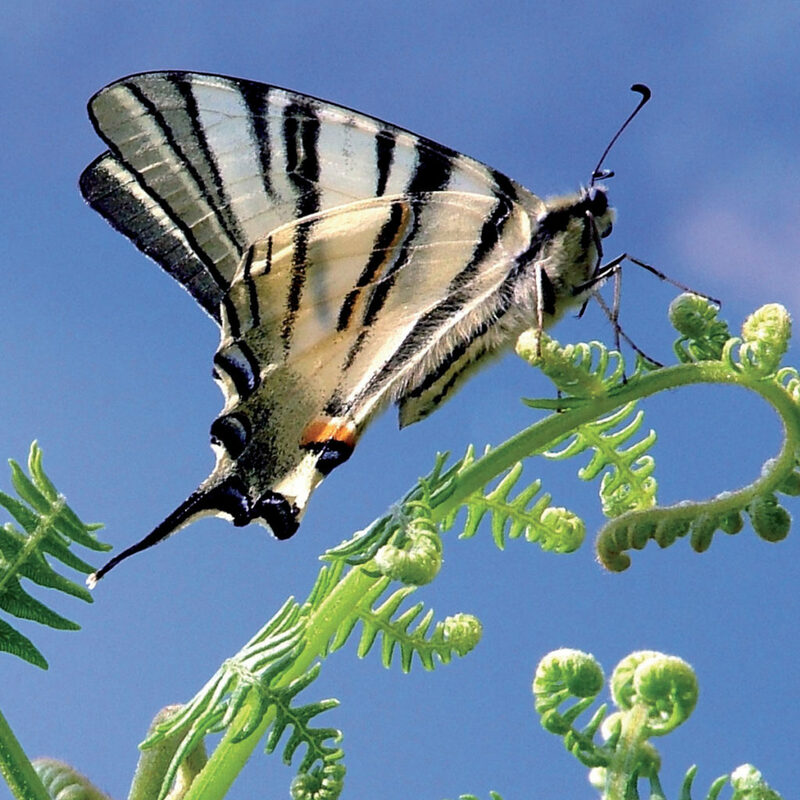 The maintenance of high biodiversity in the environment must be an overriding goal for production activities, especially in the primary sector. Agenda 21 (objectives 4 and 5) indicates the path to save the Planet: management of water resources, energy sources, protection of marine ecosystems, forests, fight against desertification and biodiversity conservation. The agrosystem can’t be considered a true ecosystem, however, it represents the best possible solution to assure environmental and production quality. A modern farmer has to face the problem of how to increase biodiversity in its farm and to manage the effects of its possible reduction, since the close relationship between the biological quality of the environment and the quality of products has been established. The “Good Agricultural Practices” contribute to the maintenance and increase of biodiversity in the agrosystems and, at the same time, improve the quality of air, water and soil. In this changing world, we are facing a strategic challenge for the future of the planet: to ensure, in terms of sustainability, the productivity of economic systems and the preservation of natural resources. In the past we worried about the impact of economic growth on the environment, but today we have to worry about the impacts of environmental stresses (soil, water and air degradation, biodiversity loss) on the production processes and our economic prospects. In other words, the problem is not only environmental but also economic. Today, to meet these new challenges, a growing number of companies develops strategies that provide an “environmental responsibility”, aimed at minimizing the environmental impacts of production processes and to support actions that are inspired by sustainable development. The company from supplier of products can become supplier of services, by certifying its direct engagement in the protection of forests, air, water and soil. A message of responsibility by companies that, in this way, also become active vehicle in the education of citizens to the issues of conservation and sustainable development. To demonstrate their engagement towards environmental responsibility the companies are encouraged to change their modus operandi. The commitment of the company towards environmental conservation, certified by an accredited body, can offer several benefits. Primarily, as United Nations Environment Programme (UNEP) has established, the environmental protection in agriculture has a large effect on the company’s image. In this context also becomes crucial and strategic to communicate to the consumers the environmental commitment of the farm. Until now, the communication ignored the commitment of the companies, where it exists, with the result that the customer/consumer fails to give the responsible farmer a recognized role in the dynamics of environmental sustainability. During 2010, declared by the United Nations “International Year of Biodiversity”, WBA proposed “Biodiversity Friend” the first certification the first certification that evaluates and scores the biodiversity conservation in agriculture. It is not merely confined to certify the engagement of the farm to a significant reduction of the biodiversity loss, but represents an incentive for the farm towards a progressive increase of biological diversity, that ultimately coincides with an improvement of the salubrity and quality of the products. In this way farmers become, finally, true guardians of the environmental integrity of the territory and, in this dimension must be considered both by public opinion and by decision makers. The management efficiency and environmental responsibility are evaluated by means of soil, water and air biodiversity indices, based on biomonitoring, developed by the WBA Scientific Committee. Each action is evaluated by a score; the farm must get a minimum score of 60 out of 100 to be certified. To maintain the certification the farmer must annually increase the score. No other improvement of biodiversity will be required after reaching a score of 80/100 points. When the farm reaches the score of 80/100, the certification audit will be biannual instead of annual. 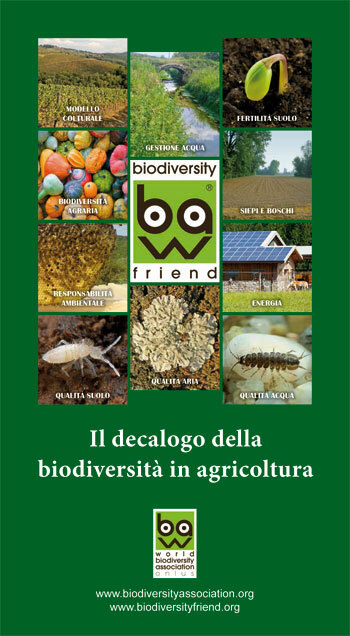 In 2010 “Biodiversity Friend” obtained the patronage of the Ministry of Agricultural, Food and Forestry Policies of Italy. The brand “Biodiversity Friend” is exclusive property of the WBA and has been registered as an international trademark in Italy, European Union and China by the World Intellectually Property Organization of Madrid and in U.S.A. by the United States Patent and Trademark Office. Until now the conservation policies were not working effectively because they have not been able to involve in a synergistic way the world of production. On the contrary, production and conservation came often into conflict each other, causing misunderstandings, radicalization of the positions and, unfortunately, environmental crisis of planetary dimensions. “Biodiversity Friend”, substantially, has as main goal the harmonization between production and conservation, the only way to truly sustainable development. The expected effects in terms of environmental improvement are enormous and, potentially, can be related to all the human activities. An environment rich in biodiversity can play a key role in maintaining the ecological balance, offering products of quality, with the best organoleptic properties. Consequently, better environmental and food quality can have positive effects on the sanitary state of the people: it has been scientifically demonstrated that many illnesses are directly related to environmental pollution and poor quality food. The environmental quality improvement can have beneficial effects also on the rural farmhouse development, for a greater attention by the clients/consumers towards plain areas, traditionally few considered from a tourist point of view. The diffusion in the agricultural landscape of hedges and woods, the most attention to the quality of air, water and soil, the cultivation of old varieties and animal races, will allow an increase of the agricultural landscape quality that, finally, for the environmental quality can be compared to the hill and mountain areas. The agricultural lands can become again the expression of the rural tradition, of its economic, social and cultural history. Even in economic terms the expected results are of considerable interest. Today, most consumers are able to recognize the quality of products on the basis of multiple indicators and to make ethical choices, careful to protect the environment and the people involved in the production process. Increasingly consumers are demanding information that go beyond the simple features of the product, but they tend to share the responsibility for the choices of the farms who, in turn, are increasingly concerned about the communication of their responsibility towards the quality of the environment in which they operate. This is a growing tendency, especially in the primary sector, where the demand of quality products is increasing respect to the great production of the industrial agriculture. For a consumer, to buy a product with the brand “Biodiversity Friend” means having scientifically verified guarantees that the product comes from agrosystems with a high degree of naturalness and has been achieved through low-impact production processes. 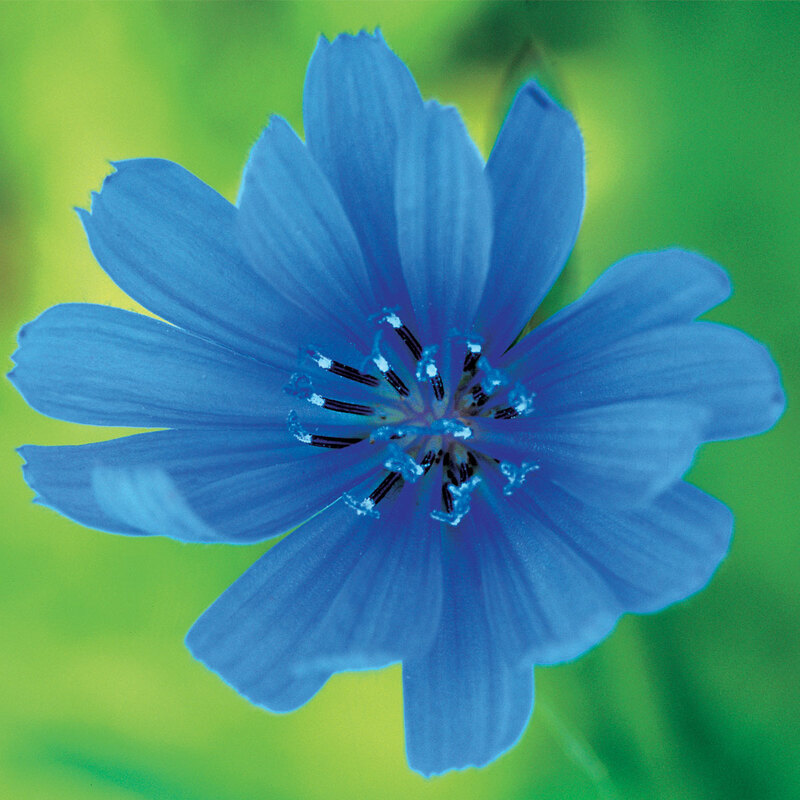 Consequently, the product “Biodiversity Friend” will be identified as a healthy product, the result of a process based on the principles of sustainability. Such a production model, based on the enhancement of local productions, will restore market balance in a perspective of greater equity to both the producers and the consumers. In fact, the farmers expect to have higher revenues due to a more rational use of resources and an increase in value of products obtained by environmental conservation processes; on the other hand, consumers are expected to have savings because, properly informed, can take advantage of a distribution network closer to the source, in accordance to the seasonality of production.